For theory examinations, max 80 marks to gain in the external examination and 20marks gain in mid-examination, Average marks in mid is 7 marks and in external examination get 28 marks to pass this pass marks is applicable when you got average marks 7 in mid-examination. Diploma lab externals conducted March/April-2019 successfully in all diploma/polytechnic gov/Pvt colleges in Andhra Pradesh. For c-09, c-14, c-16, ER91 regulations. 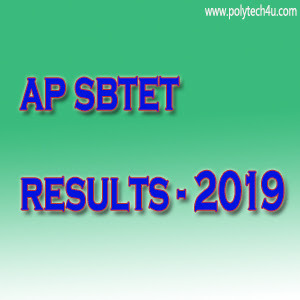 SBTETAP RESULTS - 2019: Andhra Pradesh state board of technical education diploma C-09, C-14, C-16 & ER91, Regular/supply exam results March/April-2019 declared at sbtetap.gov.in. Students can check results in below direct links. Check the results by entering reg.no, semester, regulation.